In her site-specific installations, videos and video installations, Anja Kempe deals with the unknown of physical space and the potential of movement. She develops architectural extensions that augment space. Her dynamic images of space act as expansive choreographies for the viewer. Her latest works deal with the body itself. She brings together the individual memory of the body and the collective memory of movements. 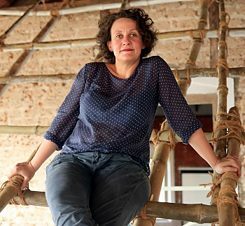 © Kochi Muziris Biennale 2016 Anja Kempe (born 1973) was educated at the Karlsruhe University of Art and Design and at the Academy of Media Arts, Cologne. She has exhibited internationally in group shows and solo exhibitions including at z33, Hasselt; Ars Electronica Campus, Linz; Schloss Solitude, Stuttgart; Museum Schloss Moyland; Halle14 Leipzig; NGBK Berlin; Young Artist Project, Daegu and ISCP New York. Together with Robert Kraiss and Tina Tonagel she ran the Artspace Maxim in Cologne. As a member of ZENTRALWERK Kultur- und Wohngenossenschaft Dresden eG she co-develops a new independent cultural venue in Dresden where she lives and works. In Leipzig she teaches at the Academy of Visual Arts. In Pepper House, Anja Kempe wants to connect several threads of her work: site-specifity, movement and displacement. 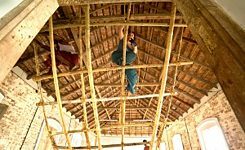 As her installations always evolve around given spatial conditions and environments Kochi’s architectural changes and tensions are an appropriate work basis. Cosy arrival in Bangalore. Staying in 1 Shanthi Road is the perfect start. Suresh is a great host. An open house where artists come and go. With a drink on the rooftop terrace we swap ideas. When it's not too hot, Suresh shows us around the city. The programme with Christoph and Maureen is very rich. We get in touch with Bangalore and the cultural scene. My flight to Kochi. Now I'm more or less on my own and try to connect to the new environment. Malabar House is a wonderful place to stay. The AC saves my life. I'm able to think straight in the face of the heat. Beautiful Pepper House offers huge space and also a fresh sea breeze from time to time. There is the summer camp running at the moment. Chitra and Kunjikuttan are working with children. They draw, paint, do clay modelling, sing and dance together. The whole area is booming with playful activity. Vipin works in the library. He's ready to help the children or me. What is my role in this environment as a European, a woman, an artist? These questions are on my mind. I walk Fort Kochi looking for suitable hammock places: a playground, a goal, a water tank, the fish market... I do a video recording of me placing the hammock and lying inside for a while. Gradually I'm approaching the place with less inhibition, feeling more comfortable, acting more naturally. In the same way the relation to the place is changing. In the beginning the hammock was a place to hide, in the end it's becoming a possibility to snuggle into the place. © Kochi Muziris Biennale 2016 The great bamboo. Scaffoldings of bamboo always fascinated me. In Kochi I want to work with bamboo. I buy some long bamboo. The guy who brings it to Pepper House knows how to do scaffolding. With the help of Edwin’s translation we start to work. A great day. We're building soft scaffolding, that's following the wall without being convenient. For the second part of the installation I transfer the structure of the scaffolding as a shadow from stone powder on the floor. One more wish is coming true. 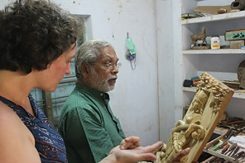 In Trissur I get in touch with Raju Mash, a master of wood sculpting. He already did lots of impressive temple figures. We're working together for one week. A wooden keeping hand also becomes part of the installation. With the children of the summer camp I do a workshop. We work on perception of movements. They take part in a video recording and we have a lot of fun together. © Kochi Muziris Biennale 2016 With some artists of Pepper House I meet more often. We have lunch together or go for a beer. I catch a glimpse of their reality of life. An evening in the studio: We're talking about artworks, listening to music and eating together. Suddenly the power is cut, the fan stops and it gets pitch-black. Within seconds it's oppressively hot. The others start to sing: polyphonic Indian vocals – an adorable moment. Next day it finally rains. Everybody was longing for it. It comes down in buckets. People in the street are beaming at each other. We let the rain hail down to us and are happy. After five weeks I struggle every single day to stay longer in Kochi. The last days in Bangalore are also good. I can see what the others have developed in the past weeks. I show my documentation in the Goethe-Institut. © Kochi Muziris Biennale 2016 ThanksRobin Detje for the term ‘‘Inner Grid’’ when we talked about my work. Before I travelled to India I often asked myself, if our inner grid can be touched or even shifted by an artwork. My work in Pepper House had this title. I still don't know if an artwork can impress the ‘‘Inner Grid’’ - this residency definitely does it.